This package includes the REVEL™ access card and bound book. NOTE: Before purchasing, check with your instructor to ensure you select the correct ISBN. Several versions of Pearson's products exist for each title*, and registrations are not transferable. In addition to the access card included in this package, you will need a course invite link, provided by your instructor, to register for and use REVEL. Dr. Sue Bredekamp is an early childhood education specialist from the Washington, DC area who serves as a consultant on developmentally appropriate practice, curriculum, teaching, and teacher education for state and national organizations such as NAEYC, Head Start, the Council for Professional Recognition, and Sesame Street. From 1981 to 1998, she was Director of Accreditation and Professional Development for NAEYC where she developed and directed their national accreditation system for early childhood centers and schools. 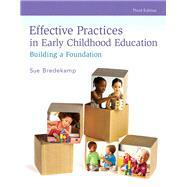 Dr. Bredekamp is the editor of NAEYC’s best-selling, highly influential publication, Developmentally Appropriate Practice in Early Childhood Programs. Dr. Kathleen (Kate) Cranley Gallagher is an educational psychologist and Scientist at Frank Porter Graham Child Development Institute at University of North Carolina at Chapel Hill. She is a Clinical Associate Professor in the School of Education at UNC, where she teaches undergraduate and graduate early childhood professionals. Dr. Gallagher has herself been an early childhood professional for over 30 years; she has taught in and administered diverse programs for children birth -8 years of age, with and without disabilities. Dr. Gallagher’s publications and applied work focus on developing, implementing and evaluating evidence-based interventions to support social-emotional well-being and development for young children, their families and early childhood professionals. Dr. Gallagher has served on state advisory panels, developing standards and assessments for early childhood education and health and is a founding member of the North Carolina Infant Mental Health Association. She developed Be Well to Teach Well, a program designed to support the well-being and of early childhood professionals. Dr. Gallagher is an accomplished teacher and frequently invited speaker nationally, and presented a keynote address at the International Preschool Teachers’ Conference in Hangzhou, China as a guest of Zhejiang Normal University. She delivered a TEDx talk, entitled, The Healthy Child: Assembly Required in which Dr. Gallagher argued that the single most important feat of construction that our society undertakes is the assembly required to build physically, emotionally, cognitively, and socially healthy children. She lives in Carrboro, North Carolina with her husband, John, and enjoys time with her two adult children, Jack and Bridget.